The brief for this competition required several public areas, including extended foyer and gallery spaces. In addition to the administration areas, the provision of artist’s studios was also indicated. 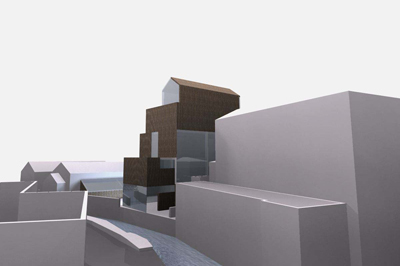 The site is located on a bend of the river near the town centre, on the site of a five-storey former mill building, with through-access via a pedestrian passage to the town’s main street, and a new vehicle bridge to be provided on the opposite side. The strategy adopts the form and scale of the existing building to create a new form, recalling the straw bales, or present-day “haystacks”, of the town’s agricultural hinterland. Straw bales are used for the walls, treated in the manner of traditional thatch. An open courtyard space serving the scheme is established on the site of the former mill yard, accessed directly by a new footbridge across the river. Opposite the gallery building a low range of artists studios occupies the edge of the site, mediating between the scale of the Centre and that of the old town.